This section describes how an environment space instance can be created based on an environment space type definition. Space instance definitions are part of the application instance section in the application descriptor. Basically, in the instance part arbitrary many elements of the defined types can be created. In addition, it is possible to set-up evaluations, which can be used to collect and process data from the environment. In the Figure below the corresponding cutout of the XML schema is shown. An environment space has two mandatory attributes. The name is used for identifying the space instance and the type relates the environment space type that is the basis for the space instance. Additionally, the original width, height and depth attributes of the space type can be overridden at the instance level via attributes. Furthermore, space property elements can be defined for storing arbitrary user data. The additional elements - objects, processes, data providers, data comsumers and observers - are described in the following sections. An object in an instance of a space object type. It is defined using the type attribute that must relate to an existing object type. For convenience, it is possible to specify the number attribute, which has the effect that moew than one object instances are instantiated with a single object declaration. If necessary property tags can be used as usual for further object customization. A process instance is defined very similar to an object. In the same way the type attribute has to used to declare the underlying process type. Also properties can again be used for passing further parameter values to the process instance. An observer represents the user interface part of the simulation environment. It is configured using mandatory attributes for the name, dataview and perspective. Please note that the dataview and perspective attributes only represent the default settings of the observer window. The user can change these at runtime as she likes. Additionally, the killonexit flag can be used to determine, if the application should be killed when the gui is closed. The observer offers an extension mechanism that allows the user interface being modified by adding new plugins. A plugin is represented with its own button on the top left of the observer. When activated the plugin can display its own view on the control area (lower left). A plugin is defined using name and class attributes. Plugin classes have to implement the jadex.application.space.envsupport.observer.gui.plugin.IObserverCenterPlugin.\ The interface is shown below and basically has methods for start and shutdown as well as fetching information such as name, icon and the view to display. The evaluation of environment data is done by specifying data providers and data consumers. A data provider can be used to define which data should be collected and a data consumer then can operate on this collected data in order to process it in different ways. A data provider is similar to a database query, which is executed once every step the spaceexecutor performs. This means a data provider does not store a history of entries but only provides the data that has been collected at the current point in time. In order to use a data provider from data consumers it is necessary to equip it with a specific name attribute. The query itself is specified using arbitrary many source and data elements. A named source element determines which space objects are of general interest for the query (corresponds to the 'from' part of an SQL query). It requires to state, which space objects of an underlying objecttype should be considered. As possibly not all objects of a given type should be included an includecondition can be employed to explicitly state what dynamic property an object has to posses in order to be considerd. If not the object itself is of primary interest for the query but only one of its properties this can be expressed using an expression inside the tag. Using the aggregate flag it is possible to determine if the source data is interpreted as multiple elements (for each included object) or as one element (list of objects). The result data is calculated via a join over all sources, i.e. the cartesian product of all source elements (similar to the 'select' of an SQL query). An aggregated source provides always only one element to the join. Finally, the concrete data model is specified using columns similar to a relational table model. With each data tag one named column is defined (name attribute). In the tag content an arbitrary Java expression can be specified for stating the desired property that should be recorded. The objects from the different sources are available via predefined variables directly using the source name. In addition, the predefined variables '\$time' and '\$tick' are available as time series represent an often occurring use case. Data consumers can be used to process data in various ways. As data consumers may be very different, the configuration is kept very general. A data consumer is specified using the name and class attributes. The class has to extend the interface jadex.application.space.envsupport.evaluation.ITableDataConsumer, which is shown below. The interface contains the method consumeData(), which is automatically called in each execution step (determined by the space executor). The method then typically has the purpose to fetch the data from a (or more) connected data provider(s) and process it in a specific way, e.g. visualize it as chart. 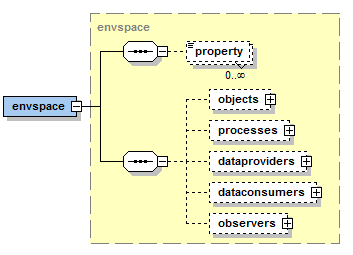 The connection to a data provider as well as other characteristics are defined using property tags. Predefined data consumers available in the distribution are TimeChartDataConsumer, XYChartDataConsumer, HistogramDataConsumer, CategoryChartDataConsumer and a CSVFileDataConsumer. In the following the XYChartDataConsumer, the HistogramDataConsumer and the CSVFileDataConsumer will be described in more details. The other consumers are very similar to the XYChartDataConsumer and only differ in the way the x-axis is interpreted. The xy chart comsumer can be used to display arbitrary many chart series in an area. The class of this consumer is jadex.application.space.envsupport.evaluation.XYChartDataConsumer. The following table shows the properties that can be specified for a xy chart data consumer. It is based on the JFreeChart class xy line chart. seriesid String The name of the data provider to useTHe name of the id property. If an id is used it is a multi series definition. Please note that it is possible to define a normal series and a multi series. A normal series is identified by a series name, whereas a multi series consists of a multitude of series that are identified by the 'id' property. In case of a multi series for each 'id' value (fetched by the id property name) a separate chart curve is drawn. If several normal series should be used they should follow a name scheme with appended '_<no>', e.g. seriesname_0, valuex_0 and valuey_0, seriesname_1 etc.